I had my stints with cheerleading in middle school and dance team in high school. It was a logical outlet for a washed-up, too-tall, teen gymnast. It required lot of work, lots of practices and performances. It was also a lot of fun. But, from a parent’s point of view, is that the best activity for my kids to pursue? I heard someone say they would rather have people cheering for their kids than to have their kids cheer for others and it made sense to me. So, in general, we’ve encouraged our kids to participate in traditional team sports for physical activity. 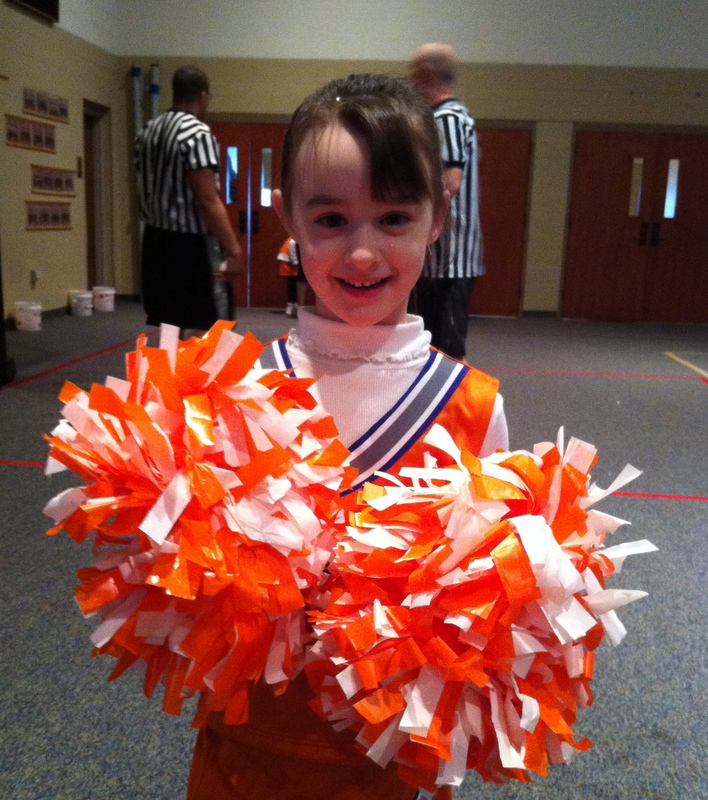 Well, this winter I dropped the ball and didn’t register my youngest daughter for basketball in time, which opened the door for cheerleading. At first, I was really disappointed, she had tried cheerleading the year before and I was ready for her to move on to something new. She’s naturally pretty coordinated and I had hoped that basketball would be a good outlet for her. As the season progressed I let go of the regret of missing the basketball experience and really enjoyed cheerleading. The fact of the matter is that this girl has a set of lungs on her and cheerleading may just be the right outlet. So, it had me thinking…. doesn’t everyone need a cheerleader. Those positive words and actions of affirmation can mean so much in the middle of the day-to-day grind. Thinking about cheerleading made me more aware and thankful for the cheerleaders in my life. In respect to yoga, I am blessed with wonderful teachers who play that role. They gently encourage me to new boundaries and are there to celebrate breakthroughs. As a yoga teacher, I am also extremely blessed with students who are cheerleaders. Their encouragement comes in forms of “thank yous” after challenging classes and in sharing their breakthroughs in their yoga practices (both physical and emotional). It is loud and clear when they encourage other students to attend classes or attend regularly themselves. I think my internal cheerleader needs to take some queues from my teachers and students. I do catch myself from time-to-time in negative or neutral self-talk. So maybe my inner voice needs a little kick of “go, fight, win”. Positives mantras should do the trick (pom poms optional). So, thank you to all of my cheerleaders, especially the one with the set of lungs. I think I’ll pay it forward by being a cheerleader myself. I’m going to be more conscious of sharing positive words and actions of affirmation, maybe you can join me. Go out and share a cheer of encouragement to someone today.